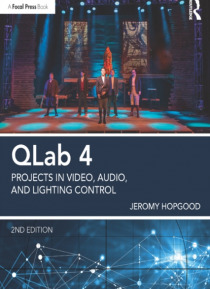 Used from Broadway to Britain's West End, QLab software is the tool of choice for many of the world's most prominent sound, projection, and integrated media designers.a QLab 4: Projects in Video, Audio, and Lighting Control is a project-based book on QLab software covering sound, video, lighting, and show control. With information on audio, video, and lighting system basics and the more advanced … functions of QLab such as show control, network capabilities, projection mapping, video effects, and cue cart integration, each chapter's specific projects will allow you to learn the software's capabilities at your own pace. In addition to the text, a companion website hosts project files, instructional videos, and more.